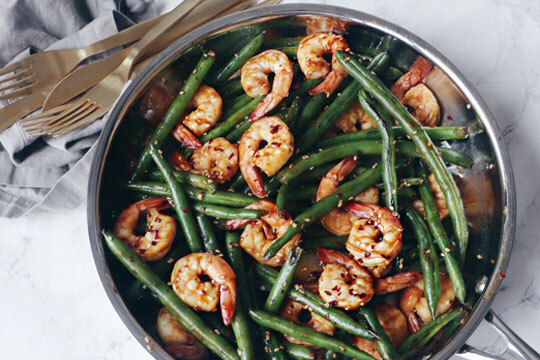 Add a tablespoon of sesame seed oil in a stainless steel pan and place it on medium heat. Add beans and cook for 4-6 minutes until lightly blistered. Remove beans from the pan and set aside. Heat another tablespoon of sesame seed oil and add the frozen shrimp. Cook for 4-6 minutes or until the shrimp is no longer grey. Add the green beans back into the pan. Add rice wine, oyster sauce and soy sauce and mix well. Cook for another 2-3 minutes and top with sesame seeds.